Scott Kelly and Mark Kelly, the “coolest brothers on the planet,” have come a long way since those early days in New Jersey. 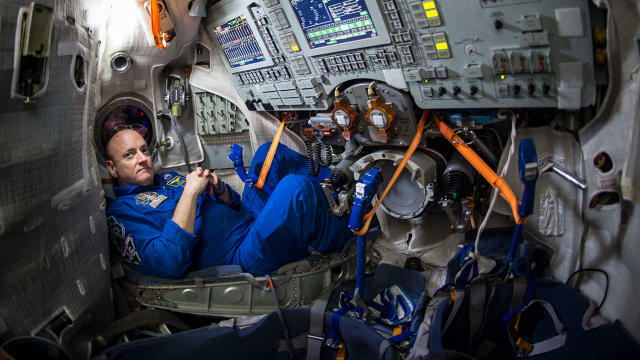 Scott spent one year on board the International Space Station and returned this March, while his brother Mark—who has already completed four space missions—remained on the ground. As such, the twins have been the subjects of a comparative study of the effects of space on the human body. Mark Kelly is also the husband of former Congresswoman Gabrielle Giffords, who was shot in Tucson in 2011 during a meet-and-greet event in front of a local supermarket. Wearing identical teal NASA bomber jackets, the world’s only sibling astronauts took turns poking fun at each other and shared inspirational stories from their days on the ground, in the air as Naval fighter pilots, and in outer space in a crowded ballroom at the Dreamforce Salesforce conference in San Francisco (October 23, 2016). Here are a few of the lessons gleaned from their banter. Mark: In the 1970s, our mom wanted to be a police officer. In order to pass the physical fitness test, she had to climb a seven-foot-two-inch wall. To help our mother out, dad built a replica for her in the backyard. She went out there every night after dinner. Initially, she couldn’t even reach over the top of this thing. And when she did, she would fall off into the dirt. After months of practice, she was able to take her test, and instead of the required nine seconds, she was over in four and a half. She was one of the first female police officers in our part of New Jersey. This was the first time in our lives we saw the power of having a goal and a plan and what it meant to work really, really hard. Scott: For the first 13 years of my life, I was not paying attention in the classroom. If I were a kid today, I would be probably diagnosed with ADD or ADHD. One day in college, I went to the bookstore on campus, and I saw a book about fighter pilots. It was The Right Stuff by Tom Wolfe. I was fascinated and read stories about these test pilots, and I saw traits in these guys that I felt I had in myself despite being an 18-year-old kid definitely on a path to nowhere. I decided then and there that I would be like these guys. I wasn’t sure how I was going to do it. The book was the spark for me to get moving in the right direction. I remembered what my mother taught us, that with a goal and plan and in small steps, you can do it. And these tiny steps all along the way became a giant leap from where I was—an 18-year-old kid who couldn’t even do his homework—to where I was at the end of my career. Mark: Life is a set of challenges. In the summer of 1990, Saddam Hussein was invading Kuwait. I was a fighter pilot, and we were carrying eight 1,000-pound bombs ready to drop them in an airfield in southern Iraq. I saw bullets coming at us. We had to go through an area with surface-air missiles. One of the worst feelings was seeing the missile coming at us getting bigger. I immediately said to Paul, my navigator, “I think a missile tracking on us.” His only comment to me was, “Roger, I am tracking the target.” I could not be any more impressed at his focus. He was compartmentalizing. To have success in that environment, you need to have compartmentalization and teamwork. Focus on the stuff you can control. Scott: In 2007, I was halfway in a six-month mission in a space station. Ground control called me to say they were privatizing the call. I was told my sister-in-law Gabi was shot. I quickly got on the phone and talked to my brother in space, and I lost contact with him. I tried to support him as best I could, but nothing was going to bring me home. I had several months ahead in the space station in front of me. I realized could do nothing. I still had to focus on my job and being the commander of the space station, I had to operate the systems. I had to control what I could control, and ignore what I couldn’t, which was this huge tragedy. Scott: I launched the space shuttle at night my first time. Of the two thousand switches and circuit breakers, if you press a button at the wrong time, you can blow up the vehicle, yourself, and your fellow crew members. I have to think to myself that nothing is more important than what I am doing right now when I am taking an action that has such critical consequences. That applies to other industries as well. Mark: In flight school, the Navy sent me to fly out in the middle of the Atlantic Ocean to make a touch-and-go landing on an aircraft carrier. That night I was debriefed by instructor who said, ‘Are you sure this career is for you?’ I did not do well. I think Tom Cruise [in his role as a naval aviator in Top Gun] would have done better landing on that ship than I did. I did not give up. I believe how good you are at the beginning is not an indicator of how good you can become. I am a prime example of someone who was able to overcome a lack of aptitude with three things: practice, persistence, and not giving up. Scott: I was assigned to fly an F-14 Tomcat, and I was taking it to a ship for the first time, getting ready to land on what looked like a postage stamp in the middle of the Atlantic Ocean. I landed so short, the tail hook hit the back of the aircraft carrier, and I almost crashed. If you cannot do this in the day when it is supposed to be easy, how can you do it at night? Over the course of the next couple of months, I had to dig down deep inside to see if this was something I was capable of doing. Eventually, the Navy hooked me up with a radar intercept officer who recognized that while I could maintain course and altitude and air speed just fine in the day, my problem was I was too complacent when things were just right. By not making constant corrections, things would get worse. I learned never be comfortable with the status quo whether it be flying an airplane or a spaceship, or managing a program. Very small, constant corrections have always been required to make things better. Mark: When we put a team together on these space shuttle missions, we do so two or three years in advance. As commander, I get a little bit of a say on who I want as my other crew members. There are certain things I like in individuals. I want people who lean forward and take risks. My biggest pet peeves are the yes-men, the yes-women. I tell the crew they are required to question my decisions. It’s not optional. If we should do something differently when it comes to mission success or safety, tell me about it, we will do it together. Scott: We are leaving the space station for last time, and we undock, I am considering this achievement. This partnership had 15 different countries and languages and engineering standards. We traveled 17,500 miles an hour in a vacuum. In extremes we experienced temperatures of 270 degrees plus and minus. We attached these modules never connected together before. This was the hardest thing we have ever done as a species. If we can build a space station and operate it safely for the last 16 years, we can do anything. If we choose to go to Mars, we can go to Mars. If we decide we want to cure cancer and put the resources behind it, we can cure cancer. If we want to fix problems with the environment or fix fiscal problems here in our country or others, we can do that too. Whatever challenges you face in your industry whatever they may be, you can meet those challenges and fix them. You can dream it and you can do it if you have a goal, if you have a plan, if you are willing to take risks and make mistakes. Mark: The best thing about this career is that it is really hard. Flying in space is hard. Choose to do the hard things because there is value in doing the hard stuff. The greatest gift we can give to our children and grandchildren is to continue to do those very hard things. We can choose to do the hard thing, and if we do that, the sky is not the limit.